Their function, or lack thereof, has taken up a huge chunk of time and led to unnecessary drama in my life. Thankfully, I’ve gotten a reprieve from that constant focus since my second transplant has been working quite well for almost 17 years now. I love you with all of my kidney. Intrigued, I continued to read the notes and found out the words heart and kidneys were almost synonymous, referring to “man’s innermost center of conscious life.” The kidneys, in the ancient Hebrew mind, represented the center of emotions. 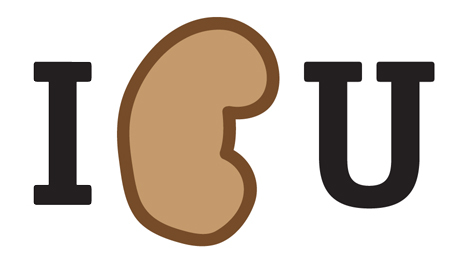 Kidneys are organs that deserve much more recognition than they get. As long as they work, you never know they’re there. But when they don’t work, you find out rather quickly how important they are. Briefly, they are the organs that filter waste out of the bloodstream and then send that waste in the form of urine to the bladder to be expelled. When waste doesn’t get filtered and expelled, then poison builds up in the bloodstream and if left untreated will cause death. There aren’t enough words to express how much I hate, loathe and detest dialysis—a machine that sort of does the work of the kidneys. I am thankful for it because it did get me through to a better life, but dialysis often made me feel weak and tired, nauseous and sometimes left me with a migraine-type headache. For some reason, my blood often took forever to clot after the needles were taken out, so I was trapped in that chair nearly longer than tolerable until the bleeding stopped. I was young and my schedule and life had been taken hostage by being hooked up to a machine three times a week for several hours at a time so that I could live. Some life. In one of my more difficult moments, I told God that if He was going to make me live like that, I didn’t want to live anymore. Then I read those verses and the notes. Despite the fact that I was nowhere near my best and not always handling the situation as well as I would have liked, I learned that I am always with Him. It’s not dependent on where I’m at emotionally, physically or spiritually, but His grace reached into my “embitteredness” and showed me that He holds my hand, He guides me and after it’s all over He will take me into glory. Listen, I don’t know why we have to go through so much [stuff] in life — some of you reading this have really been through it. I can hazard a few guesses about some situations and throw some theological baloney sandwiches out there. And hindsight, at times, can reveal real purpose in the pain. But truth be told, I don’t know why. What I do know is that there is a God and He deeply loves each one of us. He’s not afraid of our questions and pain. If we allow Him, He will show us His great love in the most unexpected ways.